Began training February 1984, age 11, at the Delaware Institute of Martial Arts under Mr. Jerry Sterling. Tested for first dan black belt (certificate #39) May 15, 1986 by Mr. Jerry Sterling. Tested for second dan black belt (ITF/USTF certificate A-2-806) July 12, 1988 by Mr. Jim Murray, 5th dan. Tested for third dan black belt (GTF certificate USA-3-11) February 29, 1991 by Mr. Jim Murray, 5th dan. Tested for fourth dan black belt (ITF/KATU certificate A-4-339), April 18, 1999 by Grand Master K.S. Hwang, 9th dan. Tested for fifth dan black belt (UITF/USA-ITF certificate A-5-1), April 4, 2004 by Grand Master K.S. Hwang, 9th dan. Promoted to purple belt, Gaijin-Ryu Jiu-Jitsu, August 2009, by Master Leroy Epperson, 8th dan. 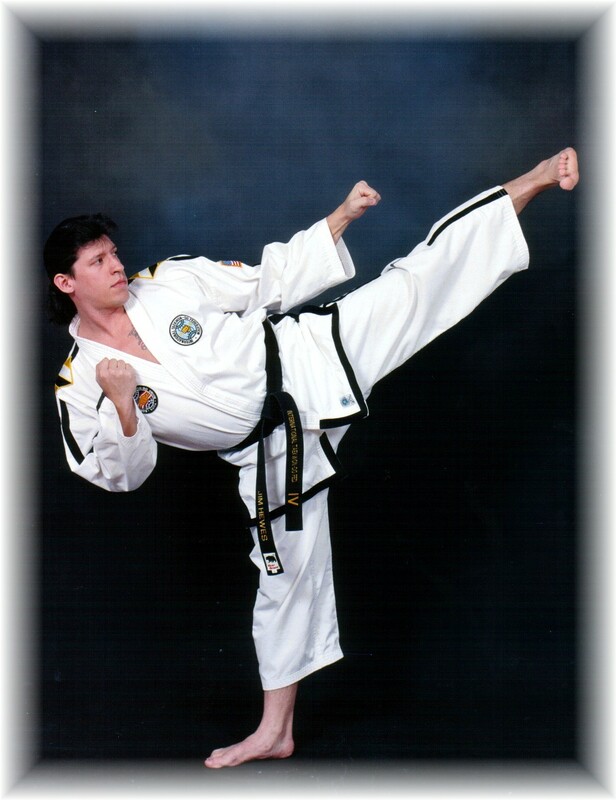 1987 - 1993: Began teaching taekwon-do at age 13, junior assistant instructor. Promoted to 2nd assistant instructor in 1990. 1993 - 1993: Provided technical assistance to Mrs. Richards and conducted classes. 1993 - 1993: Provided technical assistance to Mr. Skinner and conducted classes. 1995 - 1997: Provided technical assistance to Mr. Faulkner and Mr. Hartsock and conducted classes and self-defense seminars. 1997 - present: Founded Flying Dragon TaeKwon-Do, March 1997. September 24, 1998 hosted technical seminar conducted by Master Sang H. Kim, 7th dan. October 1998 attended Annual KATU Technical Seminar conducted by Grand Master K.S. Hwang, 9th dan. April 10, 1999 updated referee certification with continued education of Referee Training. July 22, 2000 updated referee and instructor certification with continued education of Referee and Instructor Training. October 14, 2000 hosted Technical Seminar conducted by Grand Master K.S. Hwang, 9th dan. September 29, 2001 hosted Technical Seminar conducted by Grand Master K.S. Hwang, 9th dan. October 12-14, 2001 completed First Inaugural ITF International Instructor Training course by Master Choi, 8th dan. April 26, 2002 conducted KATU certified referee course with Mr. Tom Metzner, Agawam, MA. July 20, 2002 conducted KATU certified referee course during KATU Summer Camp, Barre, MA. August 10 & 11, 2002, Techincal Seminar, assistant to Grand Master K.S. Hwang, Fairbanks, AK. October 19, 2002, hosted Techincal Seminar conducted by Grand Master K.S. Hwang, 9th dan, Clayton, DE. December 14, 2002 attended Technical Seminar conducted by Grand Master K.S. Hwang, 9th dan. December 6, 2003, attended Technical Seminar conducted by Grand Master K.S. Hwang, 9th dan. April 10, 2004, Technical Seminar, assistant to Grand Master K.S. Hwang, Venice, Italy. 1988 - Jim Murray's TaeKwon-Do Summer Camp, Pottstown, PA, participant. 1989 - Jim Murray's TaeKwon-Do Summer Camp, Pottstown, PA, participant. 1990 - Jim Murray's TaeKwon-Do Summer Camp, Pottstown, PA, participant. 1999 - Hwang's Annual Summer Camp, East Haddam, CT, instructor. 1999 - Hwang's Day Camp, Christiansburg, VA, instructor. 2000 - Hwang's Annual Summer Camp, Barre, MA, instructor. 1999 KATU Instructor of the Year, presented by Grand Master K.S. Hwang. August 19 - 31, 2000 Attended 5th Junior World Taekwon-Do Championships, DPR Korea. 2002 Head Coach to the U.S. Junior World Championship TaeKwon-Do Team. CPR/First Aid Certifide thru the American Red Cross. 2002 US Junior National's Tournament Coordinator, April 27-28, Manchester, CT.